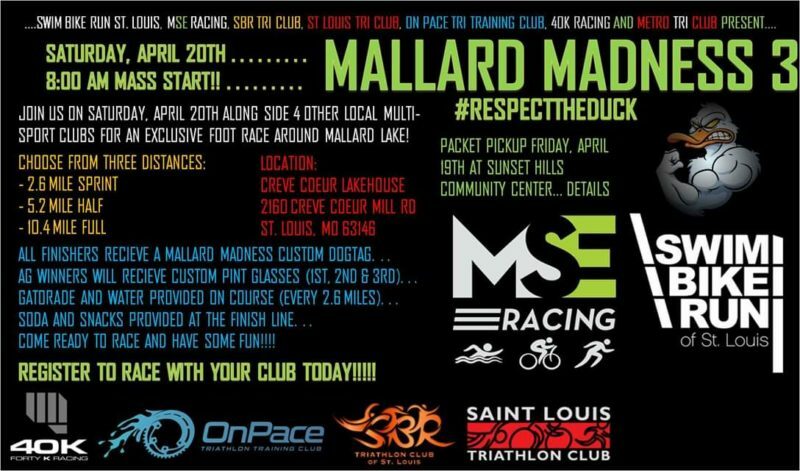 This footrace event takes place at scenic Mallard Lake, located directly behind the Creve Coeur Lakehouse Restaurant at beautiful Creve Coeur Park. You along with 3 other local clubs have the opportunity to come out and run either our Sprint (2.6 mi), Half (5.2 mi) or Full (10.4 mi) distance race. The Mallard course is a 2.6 mile loop ran clockwise around Mallard Lake itself, starting and finishing at the Lakehouse Restaurant. It is approximately 1.5 miles of concrete path and 1.1 miles of crushed rock (similar to Katy Trail) per loop. You can expect a marked course, full chip timing and a professional race setup / environment including a finisher’s podium and award session. Aid will be located at the Lakehouse with Gatorade and water, and will be accessible to you every 2.6 miles. There will be 4 bathrooms on-site race morning. I’m interested, what’s the cost to race? Absolutely nothing. If you are a 2019 registered member of Swim Bike Run Triathlon Club, St. Louis Triathlon Club, On-Pace Triathlon Training Club or 40k Racing, you qualify for entry. This event is EXCLUSIVE to you, it’s FREE for you to enjoy and on behalf of all clubs involved along with Swim Bike Run St. Louis and MSE Racing, we thank YOU for being a part of our St. Louis multi-sport community! Explain that distance to me again? RSVP for the race below. Easy-peasy. We will have Mallard Madness dog tags for all finishers! Podium spots will be top 3 Male and Female finishers by race distance under the following age groups: under 20, 20-29, 30-39, 40-49, 50-59, 60+. Podium winners will receive a custom pint glass.